Emily Seebohm isn’t happy with the Australian media. IT MAY be a home Commonwealth Games, but Australia's Emily Seebohm is not exactly feeling the love. The world champion has blamed the Australian media for being down on confidence after being relegated to 200m backstroke bronze on the Gold Coast on Sunday night. Kylie Masse clocked a new Games record (two minutes, 05.98 seconds) to claim gold ahead of fellow Canadian Taylor Ruck with Seebohm clinching bronze from lane two. At her third Games, Seebohm took her overall tally to a remarkable 13 medals. It was the second time in as many days the Canucks had relegated Seebohm to a minor medal on her home turf. World record holder Masse held out Seebohm by 0.03 of a second to claim an absorbing 100m backstroke final on Saturday night, also in a Games record. Seebohm said she was proud of her results to date - but reckoned the Australian media didn't feel the same way. At the 2012 London Olympics, Seebohm famously blamed a social media fixation for missing out on 100m backstroke gold. Emily reacts after the 200m backstroke final. 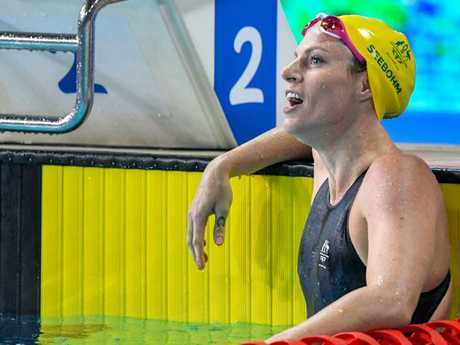 Seebohm was the favourite for the 100m backstroke event at the Olympics, but staying up late using social media may have contributed to her falling short. "I don't know, I just felt like I didn't really get off social media and get into my own head," she said. "I guess when you swim that fast in the heat, then people put pressure and more pressure on you, saying 'Oh, you're going to get the gold'," she said after the race. "Maybe I just started believing that and just thought I'd already won by the time I had swum and I hadn't even swum yet. "When people tell you a thousand times 'you'll get the gold', somewhere in your mind you are going to say 'you've done it'." 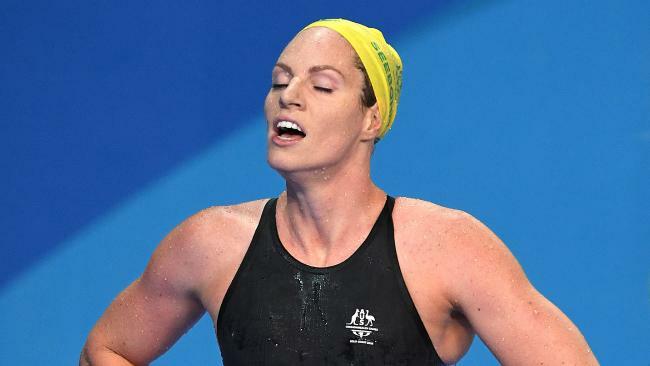 Entering the Comm Games, Seebohm was again tagged as the favourite to claim the gold in both the 100m and 200m backstroke events. She fall agonisingly short in the 100m race in what could have been blamed on a bizarre stadium quirk of the Gold Coast Aquatic Centre. The outdoor stadium was a major concern for the 25-year-old heading into the event - and her nerves were proved correct on Saturday night when the unique conditions of the open roof venue wreaked havoc on her gold medal charge. But it was the media itself who was in her sights after a surprise 200m bronze at the Comm Games. "After the 100m yesterday I felt happy with it but I felt media-wise it was a bigger deal that I didn't get gold, that it wasn't an achievement to win silver," she said. "For me it was like downgrading my achievement. "I felt lacking in confidence, like silver wasn't good enough but I know I did the best race I could." Seebohm, 25, was Australia's headline act at the 2017 world titles in Budapest, winning the Dolphins' solitary gold (200m backstroke) as they drifted to a lowly eighth on the medal table. But on the Gold Coast, Seebohm has been reduced to a support role. The 12-year Dolphins team veteran claimed her Gold Coast results would only motivate her with one eye already on August's Pan Pacs in Tokyo. "I knew it was going to be really tough here but it is good to practice against the best in the world all the time because that will make me a better racer," she said. Seebohm's current Games haul is five gold, four silver and four bronze. She still has the 50m backstroke and 4x100m medley relay to contest at the Gold Coast. Unfortunately for Seebohm, the fans haven't exactly agreed with her taking aim at the media and blaming them for sapping her confidence.